Money always grows on `trees`, Mr.Prime Minister. Prime Minister forceful, long and a `rarest` of a rare address to the Nation on 21st.Sept-2012, hailed by a section of media need to be considered as a historical watershed in Indian politics. The speech makes a clear business and political intention of the PM. It gives an independent damage control path triggered by Peoples Protest and anger against Price Rise in India. Let us not forget the India`s work stood freeze by National strike a day before called by Traders, government allies and opposition in protest against the backdoor entry of FDI in retail. A common man suffering from economic pains shall disagree with this folk remark. Tree who takes the poison called carbon di oxide and converts it into oxygen in a hidden relationship is a survival for all. What common man knows is the shade, wood, flowers, leaves and fruits from the value addition of the tree makes it a `Giving Tree`. Humble reasons of the simple disagreement with PM phrase are not difficult to analyse. Money does not grow on trees ? Is a part of his political fire fighting speech to keep the majority helpless in search of false hope ? A seed while growing makes no sound but while falling make a huge noise. Distribution of wealth is noisy while creation is always quiet. Honourable law makers and enforcement agencies needs to realize that during wheel of production all fingers are equal while during wheel of consumption and distribution the fingers of the same hand become unequal. Sample a more clear example from the roots of the real production cycle. Manufacturing of a cotton T-shirt in a textile mill takes few days to get ready and to get sold. Transformation of one planted cotton seed to generate 100 more seeds via fruit takes a full harvest season of almost 100 days. Policy makers in India need to search solutions in favour of majority because 70% of the farmers are engaged in agriculture. Speed of one cotton T-shirt production involving the source of one seed multiplying to say 100 seeds as a normal wheel of production but where is the fair wealth distribution mechanism? Few handful thieves at times in broad daylight want to want to steal the national fruits (wealth) for the exclusive growth of one percent privileged. While stealing the fruit when caught they shout that fruit is bad or they are taking it to generate more jobs. Transformation of life from seed to fruit remains the collective responsibility. To convert a `seed to fruit` a national team needs to work with a clear role. Here a law is required to shape up team work. To distribute the fruit & inclusive wealth again an effective law is required. Strong effective regulation of laws monitoring a `work tree` can help justify a fair wealth distribution of the national fruits. Success always comes when preparation meets opportunity. If there is a fault in the basic porous design of the state format with no regulations the crisis shall bound to come. In India there is a presence of strong laws but there is no strong application of these laws at ground zero. All is not well in the daily survival war of the common man with his squeezed pocket and no guarantee of justice. Money shall never grow on `fake trees` called share bazaar, controlled by casino laws of gambling. National resources are been sold each day as if they are fruits hanging on a tree. Money never grows by unfair allocation of 2G spectrum, KG Basin gates, Coal mining gates protected by ministers in India. PM says : We need to bring in Companies of High Standards. 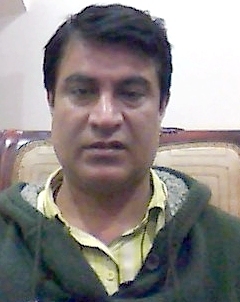 Thanks to the Indian Agriculture activist Mr. Divinder Sharma and his findings on the `less and loose` character and the standard of vidayshi( foreigner) company which is covered well by alert media. Profit with turnover of Indian retail market without Wal Mart is estimated to be around $400 billion. Employment generation in the conventional Indian retail system: More than 12 million retailers employ 40 million people with bare footed `chotus` as the delivery men. Wal-Mart’s turnover is also around $420 billion, but it employs approximately only 2.1 million people which is twenty times less then the Indian Retail market. 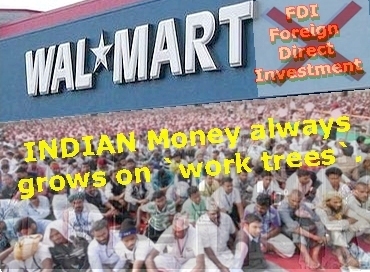 If Wal-Mart with its aggressive `animal spirit` can achieve the same turnover of the present Indian retail market with twenty times less workforce employed by the Indian retail sector, how do our PM expects big foreign retail to create more jobs? Here in Zambia the Wal Mart operates with 51% share but under a different name. Why Wal Mart compromises with a different name if its known brand, its fame and operations are so acceptable ? Score card of Desi (Indigenous) squeeze in Indian Industry ? India`s economic growth story without Maruti is incomplete. Users in India takes a pride in its shinning,value for money and the most economical indigenous car produced in India. Maruti car in India`s economy growth story takes a pride place in its shinning and most economical indigenous car production. Maruti accepted trajectory in the economic growth of India and job creation story stand unmatched. Challenge and conflict of interest starts when the state policy of any nation driven by American Capitalist model fails to distribute the industrial wealth generation. Recent Maruti unrest and its closure unmasked the unfair wealth distribution limitations in shinning Indian story. We saw a senior manager in this car production unit of Manesar plant burned alive and killed during protest. Result ? More then 500 workers lost their jobs in this historic inhouse industrial action and dispute. State government in India was found helpless caught looking down with `no action` as a spectator. Regulation Law for better human capital treatment in Indian industry is a must. It is very shocking to see that corporate government nexus instead of improving the infrastructure of roads, hospitals, schools around the coal industry and instead ensuring more money in the pockets of more people/workers is cheating and stealing the profits of Indian resources. This is done by reducing the permanent work force to half and then increasing the casual contract labours with slave conditions or with forcing no work contract at all. In India a regulation of law for equal treatment (if not more respect) for human capital is must. Has the government learned no regulatory lessons from the Maruti crisis and the shadow boxing (Nora kushti ) on FDI ? Hidden masters are corporate and not the politicians. Corporate do not believe in any law for fair wealth distribution.Investors are unhappy if workers demands even 5% rise in their pocket savings each year. Their booty and profit should grow up to 2000 % in five years as we all see in Maruti industrial crisis. Money always grows on `work trees`. It needs a collective nursing of the tree by various stakeholders. Distribution requires collective monitoring by various stakeholders and alert regulation of laws by Governments. Fruits should not be sold without a proper evaluation of the market.